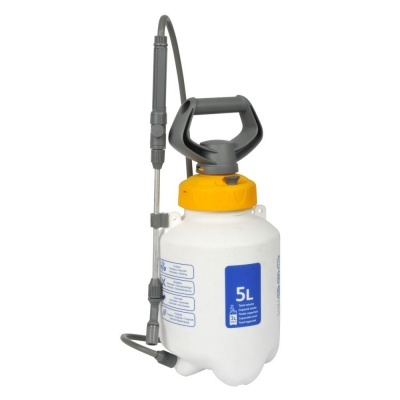 Hozelock 5ltr Pressure Sprayer Incl. Container & Lance provides a high quality, convenient multi-purpose sprayer that can be used for multiple applications. Carryable spray tank for chemical / liquid spraying in the garden or plot with integrated in-built pressure release valve. Simple manual pump action pressurised container (using D Grip handle) allows air pressure to be loaded into air gap at top of container. Designed for up to maximum of 3 bar pressure. Lance included has an angled cone nozzle fully adjustable from a single jet to a fine mist. Translucent, graduated bottle for accurate chemical mixing and dosing. 5 Litre tank capacity can be compromised in order to provide sufficient 2 litre max. air gap during pressurisation of the bottle.